There’s a bunch of ways to say it. No matter what you call it though, this page has you covered. There’s an overwhelming amount of options out there to control your drum sound, so we’ve put everything you need to know on one page. 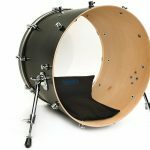 We’ve got the best drum dampening products, the best homemade drum dampening techniques, and the best drumheads with built-in dampening. If you’ve ever wanted to know how to make your drums quieter, how to stop drums ringing, or how to use dampening to get the best drum sound in any situation, this page is for you. 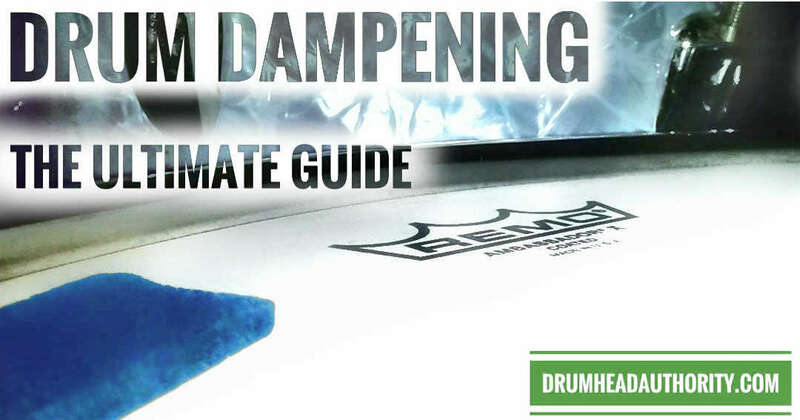 This is the ultimate guide to drum dampening, from Drumhead Authority. What does this drum dampening guide cover? We’ve got the how, what, and why of drum dampening, including drumheads with built-in dampening, add-on drum dampening accessories, and commonly-used DIY and homemade drum dampening methods. There’s advice on when and how you should use dampening, and a lot of other useful drum dampening tips and tricks. All of this is here to help you get the best drum sound possible, and to encourage you to tailor your drum sound to the song or environment. If you’ve ever asked “how do I make my drums sound better?”, then this page, combined with our drum tuning basics and drum tuning tips, will get you there. First up, we’ll cover some important background stuff. After that, we’ll go through the best drum dampening options to make drums quieter, reduce drum ringing, and control your drum sound. Tip: If you’re unsure what something means while you’re reading, head over to the Drum Sound FAQ for definitions of all the important stuff. Otherwise, or start scrolling to see everything. Drum dampening is when something is added to the drum or drumhead, changing the drum’s sound. Drum dampening can also be called “drum muting”, “drum muffling”, “drum damping”, “drum choking”, or “controlling the sound”. It can also be called “turning your drum into a wet cardboard box” if you overdo it…! There are a lot of names for it, and some people prefer one over the others. This isn’t an article on etymology or semantics though, so we’re going with dampening. Basically, less… Drum dampening removes or changes things in your drum sound. This is why dampening is sometimes also called “control”… You’re controlling the ringing, overtones, sustain, volume, or certain frequencies in your sound. Why do people dampen drums? Well, it’s perfect if you need to make drums quieter, if you want to stop drums ringing, or if you’re trying to get a specific drum sound. Different types of drum dampening will give you different outcomes (and you can read more about this below). You can have anything from a tiny change in sound, right up to extreme drum muffling. Once you know how different dampening methods work, you can use this knowledge to your advantage and create a great drum sound. More importantly, you’ll be able to tweak your drum sound with dampening to match the style of particular tracks or the requirements of different environments. We’ll look at the different types of drum dampening further down this page. First, though, there are a few more important things to cover. 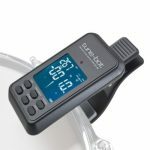 Do I need to dampen my drums? Whether you use drum dampening, and how much you use, depends entirely on the sound you want. As you’re reading through this drum dampening guide, you’ll get to understand how each dampening method affects your sound. Different situations call for different amounts, and many drummers choose to use absolutely no dampening on their drums at all. It’s up to you… Think about what the song call for, and the kind of drum sound you want to create. It’s important to mention tuning early in this article, especially because sometimes drum dampening is used to remove strange ringing overtones that don’t mix well. If your drums are tuned well, you’ll have less of these clashing overtones. More importantly, when you tune well, you’ll be able to create the good kind of ringing… you know, that nice tone that elevates your drum sound to something really interesting and special. So why it better to tune well, rather than just adding some dampening? When you’re adding dampening to simply cover up bad tuning, you risk losing a lot of tone and character in your sound. You’ll also risk reducing your volume and projection, and you can end up with weak sounding drums, especially from the audience’s perspective. When tuning drums, the key thing to remember is to have each lug tuned to the same tension. If you tap the drumhead’s edge close to a lug, the pitch should be the same as all the others. Get this right, and you might not need to use drum dampening at all. Of course there is more than one reason to use dampening on drums, but good tuning should be the starting point for any drum sound. Use dampening for the right reasons (to achieve a specific drum sound), rather than the wrong ones (covering up bad tuning technique). Tip: For more on tuning, check out our drum tuning guide, extra drum tuning tips, or the Tune-bot drum tuner. Drum dampening will affect your volume and projection. Quite simply, more drum dampening = less drum volume. This is why dampening is sometimes called drum muffling… You’re muffling the drum sound. Importantly, you can use this knowledge to your advantage depending on the situation: If you’re playing a super loud rock show, you might consider removing your dampening. If you’re playing at a tiny cafe with strict noise restrictions, a huge amount of dampening can be a life saver to muffle your drum sound. While most dampening options won’t affect your volume too much, it’s important to keep this in mind as you add dampening to a drum (especially if you’re adding a lot). Different environments call for different types of drum dampening. A good example here is with microphones on your drum kit. Listen to how things sound through the mics, and adjust your drum dampening as needed. A live show without mics might require different amounts of drum dampening compared to a show with mics across the entire kit. A recording studio usually needs different drum dampening compared to a live gig. Specific songs may require different dampening when you’re in the studio. 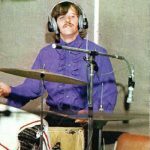 Think about the best drum sound for you in all of these situations, and whether the drums are supposed to be front-and-centre, or more in the background of the mix. With microphones on your kit, the location of the drum dampening also becomes more important: Putting some dampening exactly where the microphone is pointed will mean the microphone picks up less ringing, compared to putting it elsewhere. This can stop drums from ringing from the microphone’s perspective, without completely muffling the drum sound. Again, use dampening to your advantage to get the sound you want from your kit, and use your ears to find what sounds best. Tip: If you’re heading to the studio, make sure you’re prepared… Check out our top tips for drummers in the recording studio. Your drums will sound different to the audience. When you’re sitting behind the kit, you’re closer to its sound than anyone else. This means you’ll hear things that nobody else can, including more of the ringing and sustain. Get someone else to play your drum kit, and walk away from it to hear how the sound changes. A lot of the ringing that you’re trying to control might simply disappear. Listen with and without drum dampening to check what works best; sometimes leaving your drums less dampened can give you more tone from the listener’s perspective, and a more lively drum sound. Your drums will sound different when combined with other instruments. Similar to the tip above, the ringing you hear will probably completely disappear once there are guitar, bass, vocals, and other things in the mix. 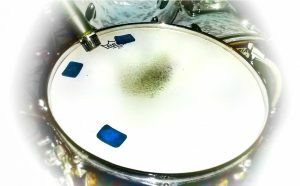 Once other instruments are involved, drum dampening could actually be harmful to your sound: You can lose tone, volume, or sustain, meaning all the audience ends up hearing is a quick lifeless “thud”. Again, listen to how things sound when there are other instruments, and adjust your drum dampening as needed. Leaving things less dampened in these situations can sometimes give you a great drum tone, but experiment to see what sounds best to your ears. Different drums can require different dampening. The same amount of drum dampening on one drum might sound completely different on another. For example, a brass snare is naturally louder and more projecting than a maple snare, and so you may need to dampen it more in certain situations. A small 18″ bass drum requires less dampening than a huge 26″ drum. The type of drum dampening matters. You’ll get very different results depending on what you’re using to dampen your drums. Thicker dampening will have a greater effect on the sound. Drum dampening that covers more surface area will also have a greater effect on the sound. Thicker drum dampening will also have a greater effect on the sound. Further below we’ll cover all of the important stuff related to this. The placement of drum dampening matters. You can get very different results depending on exactly where you put dampening on a drumhead. For example, putting a Moongel in a drumhead’s center will give much more dampening compared to putting it around the edge. Adding drum dampening closer to where a microphone is pointing will have more effect on what that microphone picks up. Even small changes in position can make a difference, so use your ears… If something doesn’t sound right, move it around. Drumhead ply and thickness will influence dampening. 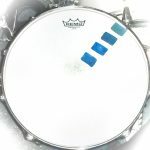 There are dozens of drumheads with extra built-in dampening, but there are also a few key things to remember about all drumheads: Thicker heads will usually give a slightly more dampened drum sound compared to thinner heads. Similarly, two-ply drumheads and three-ply drumheads will give you a slightly more dampened drum sound compared to single-ply drumheads. Higher frequencies are slightly reduced as drumheads get thicker and have more plies, leaving more emphasis on midrange and lower frequency tones. Once you know the rules, you can break them. When you’re doing this stuff, be aware of how all of the factors above can affect your sound. The drum dampening tips on this page are excellent starting points, but there’s no one-size-fits-all rule. The most important thing here is to use drum dampening to get a specific sound, and to use your ears while doing it. The drum sound you need will likely change depending on your playing environment. It’s not rocket science, but it can take some experimentation… Don’t be afraid to mess around with different methods to learn how your kit responds. Some of the biggest names in drumming have used crazy and extreme drum dampening methods (especially in the studio), because they have a specific drum sound in mind. Use your ears when doing this stuff, and don’t let the rules scare you from experimenting… If you’re ever unsure, though, the best advice to fall back on is to use less dampening than you think. Alright, so we’ve covered a lot of the important background information, and now we’re ready to dig deeper into the finer drum dampening details. There are two categories of drum dampening available: Built-in drum dampening, and add-on drum dampening. We’ll cover each of these in detail now. This is dampening that is already installed on the drumhead, and most of the time it can’t be removed. All drumhead manufacturers have different drumheads available with built-in dampening. Built-in drum dampening can give anything from a subtle change in sound to very extreme amounts of drum muffling and control. Each type of built-in dampening will have a slightly different effect on your drum sound, so read on to figure out which is best for you. Control rings look like rings either printed or stuck onto the drumhead. These are one of the most common forms of built-in drum dampening, and the most varied… There are a huge range of drumheads out there with control rings. These rings can range from thin to very thick, with thicker rings providing more dampening to your drums. Control rings are usually most effective at reducing overtones, stopping the strange ringing frequencies you hear when you hit a drum. The result is a drum sound that seems smoother and more focused on the pitch you’ve tuned your drum to. Control rings can help if you have hard-to-tune drums, as they make the drumhead more tolerant to tuning problems. Control rings can also reduce the sustain and make the drum deeper in pitch, especially when they’re thicker. Here are some typical examples of drumheads with control rings installed for dampening. 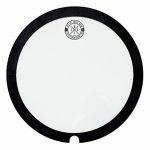 Remo Pinstripe: This is a two-ply drumhead with a control ring towards the edge. Outside this ring, the two plies of film are stuck together with Remo’s “overtone reducing agent”. Inside the ring, the two plies float freely. The result is a much more focused sound, with less overtones and more emphasis on the fundamental note that you’ve tuned your drum to. You’ll still have some sustain, but it will sound smoother. The Pinstripe falls in the middle of the control ring drum dampening spectrum: There’s a moderate amount of control, without completely choking the drum. Evans EMAD: These bass drum heads come with two removable control rings (one wide and one narrow), meaning you can choose the amount of bass drum dampening depending on your situation. The EMAD rings are made of foam (which absorbs some of the drumhead’s vibration), and they’re easily installed around the front of the drumhead… You can quickly change your sound without removing the head. The location of the EMAD rings means that higher-pitch ringing overtones are greatly reduced. The result of this bass drum dampening system is a much more focused sound, with less overtones and an overall deeper, punchier sound. With the wide EMAD ring, the bass drum muffling is quite extreme. Using the narrower ring gives moderate dampening, and leaving the rings off leaves you with a much more open sound. The EMAD’s versatility makes these bass drum heads the perfect choice if you want to have bass drum dampening options. Aquarian Studio-X: This is a responsive single-ply drumhead with a control ring stuck to the underside. The control ring reduces the higher frequencies that occur around the edge. The sound of these drumheads is slightly punchy and deep, with a fairly good attack. The control ring focuses the sound, but doesn’t choke the drum; it gives a low-moderate amount of drum muffling. The Aquarian Studio-X is a great option if you want something more responsive than a Remo Pinstripe, but still want to control some of the overtones. The Studio-X is a good choice for low and medium volume styles of music. Want to see more? Take a look at the huge range of Aquarian, Evans, and Remo drumheads with control rings for dampening. These are also known as “Power Dots” or a “Power Center”, depending on the brand you’re buying. Control dots are stuck to the center of a drumhead, and usually give a little more focus to the sound. A larger dot will have a greater effect on the sound, while a small dot won’t change things too much. When struck in the center (on the dot), these drumheads will give slightly less overtones. The drum’s sound can also become slightly more punchy. As well as dampening the drum sound, control dots help to increase a drumhead’s durability… The extra material on the drumhead means you can hit a little harder without doing damage to it. For this reason, control dots are often used by hard-hitting drummers. 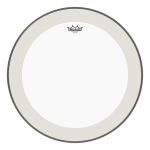 Control dots are the only built-in drum dampening type found in the center of the drumhead. Compared to control rings above, control dots usually have less of a dampening effect (although this can depend on the width and thickness of the dot). It’s important to note that some control dots are found on the top of the drumhead, while others are on the underside. This is critical if you use brushes: A top dot interferes with sliding the brushes across a drumhead, so make sure your dot is underneath the head if you’re a brush player. If you only use drumsticks, the location of the dot won’t make much difference. Aquarian Classic Clear with Power Dot: Compared to the regular Classic Clear, this drumhead is slightly more focused due to the control dot. When hit in the center, there are less ringing overtones. When hit around the edge, however, these drumheads can still produce some nice colourful tones. This makes them a versatile option for adding some different accents to your drum sound. As well as dampening the drum a little, the dot also makes the drumhead more durable. 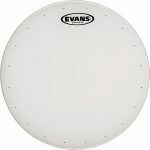 Evans Power Center Reverse Dot: These drumheads have a similar sound to the Aquarian Classic Clear with Power Dot above. There is slightly more focus when struck in the center, and more overtones when hit around the edge. As well as dampening the drumhead, the dot increases the durability, allowing for a little more heavy hitting. The control dot is on the underside of this drumhead, meaning it is also brush-friendly. 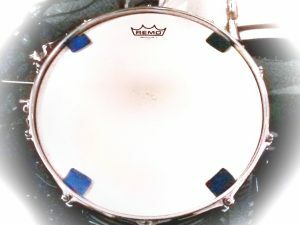 Remo Controlled Sound: This drumhead is very similar to the Aquarian Classic Clear with Power Dot above. The Remo Controlled Sound is like a Remo Ambassador, but with a control dot in the center. The control dot gives a little more focus to the sound, and increases durability. You can hit these heads a little harder than an Ambassador, to produce a bigger attack. When hit in the center, the Remo Controlled Sound gives you a more controlled sound (!). If you want to add an accent with more overtones, hitting these drumheads around the edge will give you just that. Want to see more? Take a look at the huge range of Aquarian, Evans, and Remo drumheads with a top control dot or a bottom control dot. Evans Genera Dry: This is the thinnest of the Evans Dry drumheads. As well as the vent holes, the Genera Dry also features an inlay ring to add extra dampening. 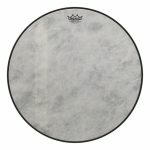 This drumhead is sensitive, and is great for low and medium volume music styles. Ringing overtones and sustain are both reduced by the dampening, which giving a more focused drum sound with more emphasis on the attack. 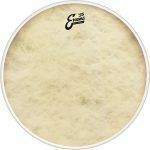 Evans ST Dry: This drumhead is similar to the Genera Dry above (it also has vent holes and an inlay ring), however it is slightly thicker and made with two plies instead of one. This difference means that the overall sound is a little darker, with slightly less ringing compared to the General Dry. This drumhead is a good middle ground in the Dry range – sensitive enough for some lower volume playing, but also durable enough to handle a little harder hitting. Evans HD Dry: This is the thickest of the Evans Dry range. Compared with the other two options above, this drumhead only has drilled vent holes (there’s no inlay ring on this one). The thicker design means this drumhead sounds slightly darker than the ST dry, and also means it can handle much harder hitting. If you play high volume music and like to hit hard, the HD Dry is a great choice. The drum dampening provided by the holes is enough to cut the overtones and sustain quite well, meaning you’ll get a big attack, and a quick sound with less ringing. Remo Powerstroke P3 Fiberskyn Felt Tone: This is a one-ply bass drum head with felt dampening, plus an inlay ring. These drumheads can be used as a batter or resonant bass drum head (or both), and they look great. Remo’s Fiberskyn range is designed to look, feel, and sound like calfskin, which is known for its warmer tone. The felt strip dampening helps to cut higher frequency ringing quite well, leaving you with a deeper, punchier bass drum sound. Building on this, the added inlay ring helps to further focus the sound. While it sounds like there’s a lot of drum dampening going on here, it’s actually very well balanced… This is not an extremely thick drumhead, meaning that without the dampening it can sometimes ring out more than people like (particularly with higher-pitch ringing). The felt strip and inlay ring give a great balance and more punch to the sound. Aquarian Modern Vintage II with Felt Strip: This bass drum head is thicker than the Powerstroke P3 above, and is two-ply instead of one. The felt strip dampens the bass drum sound, meaning less higher frequencies, less overtones, and reduced sustain. Like Remo’s Fiberskyn range, The Modern Vintage range is also designed to look, feel, and sound like calfskin. Compared to the Powerstroke P3 above, the Modern Vintage II is darker sounding, with more emphasis on the midrange and low frequencies. The felt dampening contributes to this sound, helping to add focus and more punch. This drumhead can handle heavier hitting, and can be used as a batter or resonant bass drum head for great results. Want to see more? Take a look at the range of Aquarian and Remo drumheads with felt dampening. Remo Powerstroke P4: This is a two-ply drumhead designed for snare drums, toms, and bass drums. The snare and tom version features a 3mil thick inlay ring for dampening, while the version for bass drums is dampened by a 7.5mil inlay ring. The inlay ring gives a moderate amount of drum dampening, helping to focus the sound and controlling clashing overtones (while still allowing for some sustain). These drumheads are a great choice for medium and higher volume playing, and the two-ply design means they can handle some heavier hitting when needed. Aquarian Focus-X: This is a responsive single-ply drumhead designed for snare drums and toms. The drum sound is dampened by the inlay ring, but not too much. The inlay ring has holes punched around it which allows the drumhead to move more freely, and these holes stop the drums from sounding choked. Compared to other options, the Focus-X gives slight drum dampening, helping to reduce some of the ringing that occurs around the edge of the drumhead (the overtones). There is still a good amount of sustain, which makes this head a great choice if you only want to dampen your drum sound a little. Evans EQ3: This is a two-ply bass drum head that has a thin inlay ring, plus a removable muffle ring that sits inside the inlay ring (between the ring and the drumhead). Without the muffle ring, there is a fairly small amount of bass drum dampening. Ringing overtones are slightly reduced, and the higher frequencies are controlled a little. Adding the muffle ring gives some extra bass drum dampening, reducing the overtones and higher frequencies more. Even with the muffle ring installed, however, the drum sound remains relatively open… The Evans EQ3 is a great choice if you want to control things a little, without overdoing it. Want to see more? Take a look at the range of Aquarian, Evans, and Remo drumheads with inlay rings for dampening. Evans Hydraulic: Evans has a two-ply drumhead with a thin layer of oil between each of the plies. Called the Evans Hydraulic, these heads provide a lot of drum dampening due to the oil absorbing much of the head’s vibration. 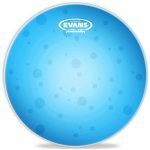 The result is a deep, punchy, and very dampened drum sound: Evans Hydraulic drumheads are a great way to stop drums from ringing out. For people who want a focused short thud, these heads are great. They’re also very useful for hard-to-tune drums, since the dampening really reduces clashing overtones. You’re left with a very focused punchy sound without the strange ringing. The thicker design and added oil layer means that you can hit these heads hard to get a big sound… the Hydraulic is a durable drumhead, but it’s not super loud since there’s a lot of dampening going on. Compared to most of the heads we’ve covered with built-in drum dampening, the Evans Hydraulic gives a much greater amount of focus and control. If you hate overtones (or have hard-to-tune drums), these are the heads for you. Hydraulic heads are available in clear, red, blue, or black, and they look great as a whole matched set across your drum kit. While this isn’t something that exclusively fits into the realm of drum dampening, the surface type of a drum can also have an impact on dampening the sound. Coated drumheads give slightly more dampening, compared to the clear version of the same head. 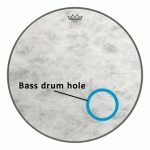 So how does the surface of a drumhead contribute to drum dampening? More mass is added to a drumhead when a coating is applied. 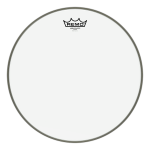 This extra weight on the head provides a small amount of drum dampening, usually slightly reducing the higher-pitch frequencies. The resulting sound is warmer, usually with slightly less stick attack compared to a clear drumhead. As well as regular drumhead coating, other types of “coating” such as synthetic fiber or a frosted layer will also dampen drums a little. It’s worth pointing out that compared to most of the other drum dampening methods on this page, coating usually has the smallest impact on the sound. The slight difference between clear and coated drumheads can be used to change your sound depending on where and how you’re playing. In the studio you might prefer the slightly warmer sound of coated drumheads, to give a deeper feel to your drum sound. Playing a live show, you might want clear drumheads to cut through better, especially if you’re playing with amplified guitars, bass, vocals, etc. Want to see more? Take a look at the huge range of Aquarian, Evans, and Remo coated drumheads, synthetic fiber drumheads, frosted drumheads, or clear drumheads. Wait, What About Drumheads With No Drum Dampening? I’m glad you asked! While there’s a huge range of drumheads with built-in dampening, there are also a lot with no dampening at all. It’s quite likely you’ve had some experience with undampened drumheads – when you buy a new drum kit, you’re almost certainly going to get undampened heads with it. In the end, the type of drumhead you choose comes down to personal preference. If you love a wide-open sound that rings out, go for drumheads with no dampening. If you know that you want to decrease the sustain, avoid overtones, or reduce the higher frequencies, then grab one of the dampened drumheads above. Hopefully by now you’ve got a good idea of exactly how each type of built-in dampening will change your drum sound. If you’re still unsure of which drumheads to buy, the best advice is to buy heads with less or no built-in drum dampening. Why? Because you can’t remove dampening if it’s built into the drumhead, but you can always add it to your drums later. The next section of this article is dedicated to exactly that: Adding dampening to your drums. Like the name suggests, this is drum dampening that you add yourself, such as homemade drum dampening or a specially made dampening product. This can include tape, Moongels, home-made drum dampening, your wallet, a towel, or absolutely anything else you can think of. If it fits on (or inside) a drum, it might be usable as dampening. No, not your cat… Obviously some things are much more effective than others. There are a huge range of drum dampening accessories out there, and many of these are perfect for getting a consistently great drum sound. These can be used as tom, bass drum, or snare drum mufflers to control your sound, reduce drum ringing, or deepen your tone. Remember that all of these drum muffling and dampening options can be used on undampened drumheads, or combined with any of the drumheads above with built-in dampening. O-rings are also known as drum rings, e-rings, or drum muffler rings. These are plastic rings that sit on top of your drumhead, instantly reducing overtones to give a more focused sound. Drum rings will also make your tone a little deeper, as they reduce the higher frequencies. 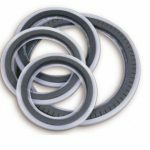 There are different sized o-rings available to suit almost any kind of drum dampening requirement, from very slight drum muffling right through to more extreme control. The amount of dampening is similar to drumheads with built-in control rings or inlay rings, with thicker o-rings giving you more control. See our drum o-rings article for more details on drum rings. If you’re a little handy, you can also create your own homemade drum dampening: make drum o-rings from old drumheads yourself. O-rings are a great choice if you want to stop drums ringing out. 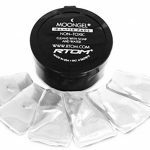 Moongels are one of the most-used drum dampening accessories ever, both for live shows and in the recording studio. What is Moongel? They’re small blue or clear squishy rectangles, and they’re perfect for getting a very precise amount of drum dampening. They stick to the drumhead, but are very easily removed. Moongels can be cut into smaller pieces (for a lesser dampening effect), or used in abundance for strong drum muffling. What does Moongel do for drums? Depending on how many you put on a drumhead (and where you put them), you can have anything from a tiny amount of drum dampening right through to an extremely short, fat, muffled drum sound. Moongels will also stop your drums ringing out, especially if you use a couple of them on the one drum. They can also be put on top of cymbals to reduce volume and decrease the sustain. These things are incredibly useful for controlling your drum sound, and are an excellent choice if you want some extra dampening. Putting Moongels closer to the edge of your drumhead will have the smallest effect on your sound, with the dampening increasing as you move them closer to the center. Small changes in position can affect the sound a lot, so spend time experimenting. A word of advice: If you’re leaving your drums unused for a long time (i.e. many months), moongels can slowly melt down, especially in heat or direct sunlight. Store your Moongels in their case if you’re worried about this! This is a long-used drum dampening trick in the studio, and it’s great for a quick, deep, muffled drum thud. It’s a quick and easy DIY homemade drum dampening solution. Putting a towel across your drumhead will give you a warmer and fatter tone, with no sustain or overtones… Towels are a very effective drum muffler, especially when spread across the entire drumhead. This is a more extreme dampening method, but can sound great in the right context. Ringo Starr often used this technique when recording drums with The Beatles. More recently, Kevin Parker used towels for drum dampening on Tame Impala‘s recordings. With this method, the thicker the towel, the more dampening you’ll get. Regardless of the towel’s thickness though, they will stop your drums ringing out. As well as draping a towel across the entire drumhead, you can tape it to part of the head to change the amount of drum dampening. If you experiment a little here, you’ll probably find a drum dampening sweet spot that can sound great when recorded. When playing live, keep in mind that towels can severely reduce your volume (this might be a positive or a negative, depending on your situation)… If you need to make drums quieter on stage, towels can achieve this (try it with towels across part of the drumhead). This is usually more of a studio recording drum dampening trick, to get a warm fat thud. 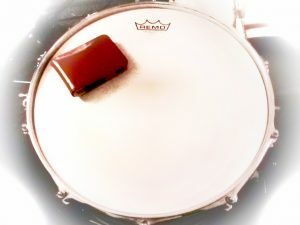 Throwing a wallet on a drumhead is another long-used DIY drum dampening method, especially for dampening a snare drum. This is also another trick to make your snare drum quieter on stage… You can reduce your drum volume a little. 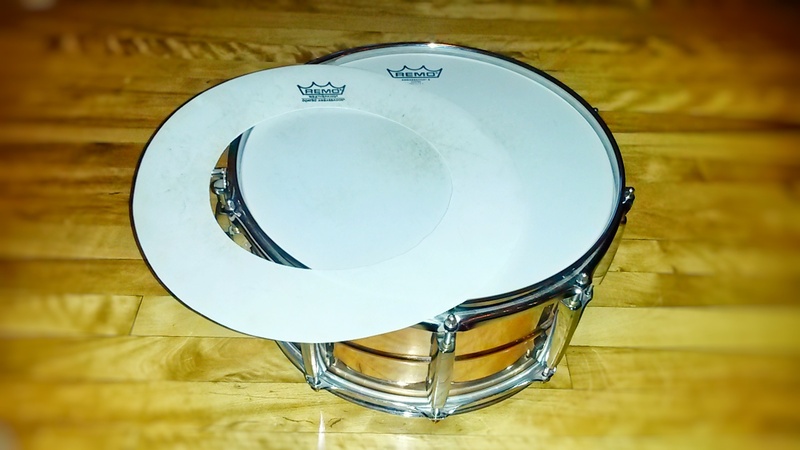 Wallets absorb some of the drumhead’s vibrations, and they add a good amount of weight to the head. The resulting sound is deeper in tone, with less ringing. The tighter sound is great for both live shows and the recording studio. If you need more dampening, simply fill your wallet up with more cash! If that last tip is not so easy, you can also open your wallet up so it covers more surface area. Just don’t leave it behind after the show…! A wallet is a quick and easy way to stop your drums ringing out. If you want something a little more consistent than your own wallet, take a look at the Drum Wallet. This drum muffler is weighted to give the right amount of dampening, and has a similar effect to a real wallet on the drumhead. It stays put by attaching to your lugs with velcro, and can be flipped on or off your drumhead quickly as needed. Importantly, the Drum Wallet doesn’t bounce around like a real wallet, but it does give a very similar warm and tight sound. This is a great device for stopping drums ringing, and getting a nice deep drum tone. The Big Fat Snare Drum takes drum o-rings to the next level. These are wide rings of plastic with a rubber edge, and they sit on top of your drumhead to dampen the sound. There are different versions of the Big Fat Snare Drum available, each of which provides different amounts of dampening (including some with tambourine jingles attached). All versions of the Big Fat Snare Drum will remove overtones and reduce the sustain, so they’re great if you want to stop drums ringing out. Your drum sound will be deeper and fatter, with a quick thud. These can be used on both snare drums and toms, and you can stack two on top of each other for a really extreme effect… Stacking them will dramatically reduce your volume, and give a quick snap to your snare drum sound (this can be really useful for smaller shows if you need to reduce drum volume on stage). The Big Fat Snare Drum is great both live and in the recording studio for a big, fat, dampened drum sound. If you’ve got an old spare drumhead lying around, turn it upside-down and lay it on top of your snare drum. This will give you an extremely dampened and deep thud, which might be perfect depending on the style and sound you’re going for. With an upside-down drumhead on a drum, the sustain and overtones will be nonexistent, and you’ll reduce the volume of the drum. You’ll completely stop your drums ringing out. This is another extreme drum dampening method, and it can sound great in the studio under the right circumstances. It’s also another great little trick for reducing drum volume on stage or when practicing. The Snareweight is a great little device for adding dampening to a snare drum. There are a few different versions available, each helping to reduce overtones and focus the sustain. All models of the Snareweight clip easily to your drum’s hoop, and are quick to install and remove. They instantly reduce ringing overtones, giving you a slightly more muffled drum sound and a deeper drum tone. The most versatile Snareweight option is the Snareweight M80, which is a leather strip that sits on the edge of your drumhead. This strip reduces ringing, and gives a slightly deeper and fatter tone. Importantly, the Snareweight M80 is easily adjustable, with magnetic clips allowing it to be either partially or fully folded away. This allows you to find the perfect amount of drum dampening. The Snareweight M80 gives you a tight dampened snare sound when fully unfolded, and less muffling as you fold it back off the snare drum head. This is a versatile drum dampening tool, extremely useful across a huge range of drumming situations. This one is not always recommended, although it’s commonly done. Why do people tape their drums? Because it dampens the sound of course, but it’s not always the best option. Tape is a less versatile drum dampening solution, mainly because it leaves a sticky reside when you try to remove it… This makes it more of a permanent drum dampening method, and it sometimes ruins your drumhead when you take it off (especially if you have coated heads). 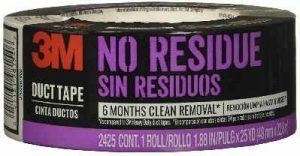 So you’ve read the warning but still want to use tape for drum dampening? Okay! Read on to see what is the best tape to use for drums, and how to tape your drumheads. Tape drumheads near the edge to reduce overtones, but still allow for some focused sustain. This is the usually the best place to put tape on drumheads, especially on the batter head. You’ll keep some tone, but stop some of the drum ringing. Tape drumheads closer to the center for much more drum dampening, making the sound fatter and shorter. This reduces both the overtones and the sustain, creating a more muffled drum sound. This is the least common place for putting tape on drums, although it is sometimes used on the resonant drumhead to control the sound (you can make an X with tape in the center of the resonant head). For a stronger dampening effect, partially fold the tape in on itself, so it sticks up in the middle (see the image). This will absorb more of the drumhead’s vibration, giving a better drum dampening effect. You can also put a small piece of folded up tissue under the tape for extra dampening. You can stack a few smaller strips of tape on top of each other, rather than covering a large surface area of the head. This will allow better tone from the drumhead, while still muffling the overtones and giving you a more focused sound. A huge amount of tape on the drumhead (covering a large area) will give the most muffled drum sound, reducing volume and projection quite a lot. One final word with putting tape on drums for dampening: Don’t overdo it! Remember that your kit will sound different from the audience’s perspective, and you can easily end up with a terribly flat, dead, over-muffled drum sound with too much tape. This one is a more extreme drum muffling trick, but it can be useful if you need to reduce the volume of drums when practicing or on stage. Remove your batter drumhead, and place a sheet of thin material between the bearing edge and the drumhead (across the entire area). When you reinstall the head, pull the sheet tight. The result is quite a lot of drum muffling: As well as less volume, your drum sound will be very short and deep, with no sustain or overtones. The sheet will stop your drums from ringing out. You can cut up an old bedsheet to do this, and experiment with covering only part of the drum if you want a less dramatic effect (similar to a bass drum’s felt strip). If you need to make drums quieter, this drum dampening trick can be really helpful. There are hundreds of products out there designed to dampen drums… Far too many to cover on one page. The above methods are some of the more common and useful ones, but if you want to browse some other good drum muffling and dampening options, take a look at the drum sound control products here. If you know of any other good products or tips worthy of being added to this page, let us know! Most of the above options are great for dampening a snare drum or toms, but many won’t work for bass drum dampening. Luckily there are some really useful methods out there for dampening a bass drum, helping you to make your bass drum deeper and punchier, or stop the bass drum ringing out. Earlier in this article we covered some bass drum heads with the dampening built-in. Now we’ll take a look at the best add-on options for bass drum dampening. The Evans EQ Bass Drum Pad is a little “pillow” that fits inside your bass drum, and it works as a great bass drum muffler. It attaches with velcro, meaning it will stay put even when playing hard. The Evans EQ Bass Drum Damper Pad is designed to rest against your bass drum head, dampening the sound after each hit. While it is usually fitted to the batter side, you can also use it on the resonant side depending on the sound you need. It bounces off the bass drum head after each stroke, allowing for a little bit of tone before it rests against the head to cut the ringing. The EQ Damper Pad gives two levels of bass drum dampening: it has a smaller side for less dampening, and a larger side for more control. The EQ Damper pad is great for very consistent bass drum dampening… It won’t float around like a pillow, and it’s the perfect size and weight for the right amount of bass drum muffling. This will stop your bass drum ringing out, but it won’t choke the drum completely. Stuffing a thin bedsheet in your bass drum will dampen a good amount of higher-pitch ringing, and make the sound more focused and punchier. Using a thicker blanket will kill the ringing completely, and make the sound even deeper. A pillow will give a similar effect, obviously changing with the size. If your material is resting against the batter or resonant bass drum head (or both), it will stop that drumhead from ringing out, and will cut its higher frequencies. Similar to the above, you can also use foam as a bass drum muffler: Cut it to size, and use double-sided tape to stick it to the drum shell once you’ve found the perfect sound. For a milder dampening effect, you can cut a newspaper into strips and partly fill your bass drum with this. This helps to control the higher frequencies, while still allowing your bass drum to remain more open sounding. All of the above techniques are often used in the recording studio to get a more focused and punchy bass drum sound. Stuffing your bass drum is a very effective way to stop your bass drum ringing out. Just remember that the more you put in, the more you’ll reduce your volume, so this may not always be great for live playing (especially without a bass drum microphone). If you need to make your bass drum quieter, completely stuffing it with a blanket (or thick foam) can be a great solution. 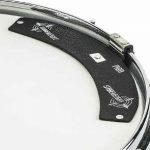 Gibraltar make perfect sized felt bass drum dampening strips you can install between your bass drum head and the drum shell. These strips rest against the drumhead, reducing the ringing and focusing the sound much more on the midrange and low end. The sound becomes deeper, punchier, and more controlled. These felt strips are usually sold in two-packs, meaning you can double up for a more dramatic dampening effect if one strip isn’t enough. 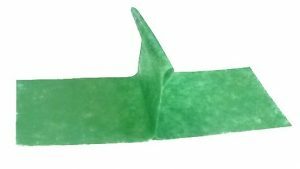 These felt bass drum dampening strips are cheap, and they’re the perfect weight and thickness for the job. You can use them on just the resonant side, or on both the batter and resonant bass drum heads (John Bonham style). When you’re installing these felt dampening strips, make sure they’re pulled fairly tight against the bass drum head as you tighten the bass drum lugs. Depending on where you place them (and how many you use) you can stop your bass drum ringing slightly, or quite dramatically. Place the bass drum felt strip towards the outside of the drum for the smallest effect, or right across the center for the greatest amount of bass drum dampening. If you’re a little handy, you can make your own felt bass drum dampening strips. Buy some felt, and cut it to size. Between 2 and 4 inches is a good width, or more if you want a greater dampening effect (smaller bass drums will require less). Make sure the felt strip is pulled tight enough to rest against the bass drum head when you’re installing it. If you can’t find felt (most fabric stores should have it), you can fold up some thinner material to do a similar job. 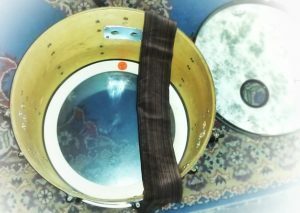 To install a felt bass drum dampening strip, completely remove the drumhead. Lay the felt across the drum, then put the drumhead back on. As you’re tightening the head, pull the felt strip tighter so that it makes good contact from one side of the head to the other. You can cut the ends back once the drumhead is installed, but leave enough to easily reinstall if you ever decide to remove it. Bass drum port holes fall into the dampening category, because (like most of the other options here) they reduce the ringing, and give you a more focused sound. You’ll have different effects depending on the size and placement of your hole, and explaining all of this stuff requires a whole other article. Luckily, we’ve got you covered… Take a look at our huge overview of bass drum port holes, covering everything you need to know: How port holes affect your sound, where to place them, how big they should be, and the best ways to cut them. This is a much more extreme bass drum dampening method, and will completely remove the ringing from your bass drum. If you want a short, quick thud, then try this one out. All of the sound will come from the batter head when doing this, so you might need to adjust your batter head tuning. Some advice: If you go with this bass drum dampening method long-term, it’s important to protect your bearing edge on the resonant side (especially if you move your kit around). For bearing edge protection, cut a giant hole in an old bass drum head, leaving 1-2 inches around the edge. This will allow you to put your resonant side bass drum hoop on, keeping your bearing edge in top shape while giving you a resonant head-free sound. If you want to stop your bass drum ringing out, this is a great method. If you’re using a hard beater, you’re going to have a much more cutting and loud bass drum sound. Try a fluffy beater, which has the smoothest and warmest sound, if you’re trying to dampen your bass drum. Check out the ultimate bass drum beater guide for more on beaters! If you’ve read this far, you should have an excellent idea on the different methods to dampen and muffle drums and drumheads. You can combine the different methods for a greater drum dampening effect, and modify them depending on your environment and situation. The most important thing to remember with drum dampening is to experiment, and this is important regardless of whether you’re a complete beginner or a seasoned pro. Experimentation is the best way to learn, and even professionals will keep messing around until they find their perfect sound. When to use drum dampening will vary depending on your situation… A loud vs. quiet show; recording big, small, tight, or open sounding drums; needing to muffle drums for quiet practice; or just looking for a more interesting sound. Think about what each song or situation requires, and how your drums fit into the bigger picture. Always use your ears, keeping in mind what the listener will hear – the audience, the microphones, your neighbours, or just yourself in your practice room. What’s the best drum dampening method you’ve used? Got any other good drum dampening methods that aren’t listed here? Check out the Drumhead Selector – The internet’s BEST tool for finding your perfect drumhead. Search, filter, and compare Aquarian vs Evans vs Remo drumheads. Line up any combination of heads to see every feature listed side-by-side. Filter drumheads by drum type, sound, ply, durability, responsiveness, surface type, thickness, special features and more to quickly find the perfect drumheads for your kit. Take a look at the internet’s most comprehensive drumhead comparison chart. See equivalent drumheads across the huge Aquarian, Evans, and Remo range, and use the search box to filter through the noise. Looking for top drum accessories and gifts? Take a look at our roundup of great drum accessories and the best drum gifts for drummers. If you’re looking for the best ways to make your drums quieter, check out our top tips to reduce drum volume.